A bit of spoiler alert! Kinda. 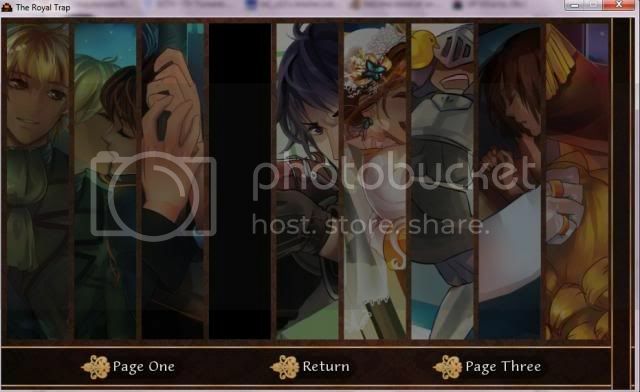 I've finished the game and accomplished all the 15 endings, so I decided to look at the gallery for the compilation of photos. On Oscar's path, once Madeleine is out of the jails and back in hers and Oscar's rooms, choose to have Madeleine hug Oscar and the pic will show. I guess it just surprised me that you can accomplish all the ends by not seeing that part. Kinda have the same problem as the OP. I've too have finished the game and accomplished all the 15 endings, and finished all the gallery pictures too but for one. It's the second one from right on the first page of the Gallery. I'm not entirely sure how that can even happen, since that should be the picture of maddie and oscar as kids from the beginning of the game, which is a required picture to go through to play the game? unless you used saves to skip around somehow? Long Live The Queen is a different kind of game. You're juggling story decisions along with stat-raising, and you will die a lot. Getting through to the end at all is, for most players, difficult. It's also a lot less wordy (no big monologues like Maddie does! this game was my excuse to get verbose) and has fewer pictures. Now, once you get the hang of the stat-balancing and can stay alive long enough to pay attention to the plot, there's a complicated plot going on with a lot of nobles scheming a lot of different things (and trying to kill you). But while the plot is there, much more is left to your imagination or deduction instead of being spun like a book to read. It does spawn a larger fanfic community as people invent their favorite theories for what characters are really like. I would suggest trying the demos for Long Live The Queen, Date Warp, and Cinders (which isn't by me, but I sell as an affiliate). Cinders is very pretty and has a few thematic elements in common with TRT so might possibly line up with your tastes.